Plenty of rain and wind is expected Thursday as an area of low pressure approaches from the west. The low and cold front pass across the area this afternoon, and the rain will come to an end by mid to late afternoon. Temperatures today will be quite mild, with the mercury rising into the 50s. Drier and colder conditions are forecast for tonight and Friday as the cold front passes to the east and brisk westerly winds prevail. Lows fall into the 20s tonight, and rise into the 30s Friday. In effect through this afternoon for all of Connecticut. Rain becomes heavy at times this morning with the potential for heavy downpours into early afternoon. A total of 1.25 to 2.25 inches of rainfall with locally higher amounts is possible. Flash flooding of urban and poor drainage areas, as well as small streams will therefore be possible. A Flash Flood Watch means that conditions may develop that lead to flash flooding. Flash flooding is a very dangerous situation.You should monitor later forecasts and be prepared to take action should flash flood warnings be issued. 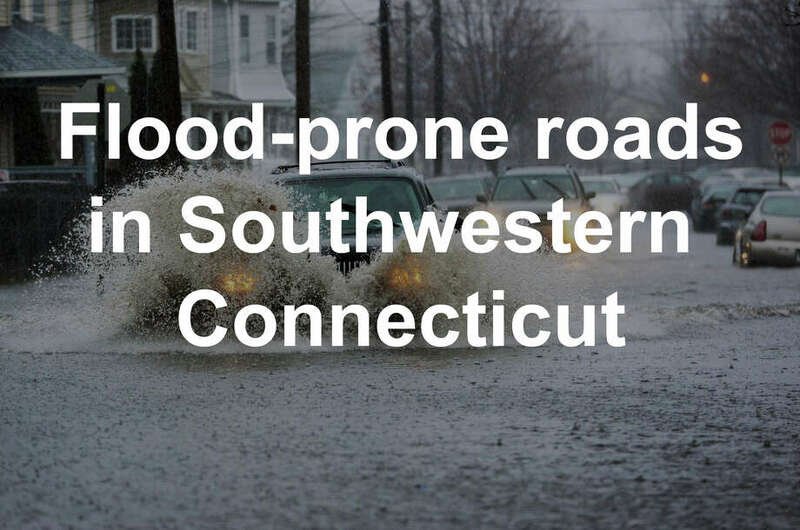 In effect for southern Connecticut from 9 a.m. to 6 p.m.
From mid-morning through the afternoon, south or southwest 20 to 30 mph with gusts up to 50 mph. Strongest gusts are expected between 11 a.m. and 2 p.m.
A Wind Advisory is issued when sustained winds of 31 to 39 mph,or gusts of 46 to 57 mph, are expected or occurring. Winds this strong can make driving difficult, especially for high profile vehicles, in open areas, and on elevated roads and bridges. Use extra caution. For the Long Island Sound shoreline from 11 a.m. to 3 p.m. 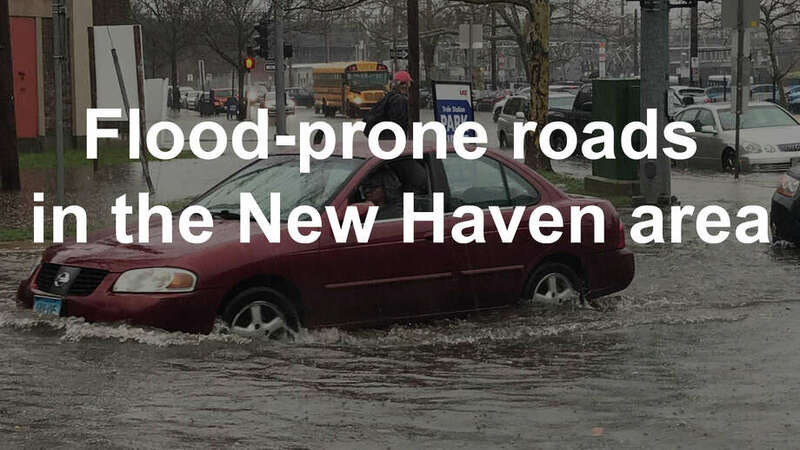 Shallow flooding is expected in the most vulnerable locations near the waterfront and shoreline. 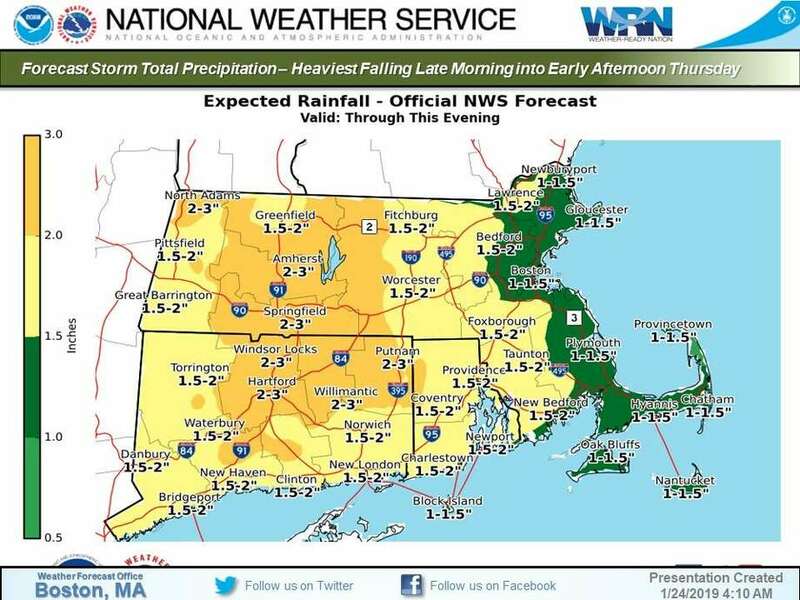 Expect around 1 to 2 feet of inundation above ground level in low lying, vulnerable areas. Some roads and low lying property including parking lots, parks, lawns and homes/businesses with basements near the waterfront will experience shallow flooding. Shoreline impacts will be breaking waves of 2 to 4 feet that could result in beach flooding and erosion, as well as splashover onto shoreline roads and properties. High tide in the western end of the Sound is around 2 p.m.
Look for another freeze-up tonight because temperatures will drop into the 20s. Temps will be in the mid-20s along the coast and a few degrees cooler inland. The NWS’s hourly forecast shows a 30-degree temperature drop between 2 p.m. (54 degrees) to 8 a.m. Friday (24 degrees). Today: Rain and possibly a thunderstorm before 4 p.m., then a chance of rain. Some of the storms could produce heavy rainfall. Temperature rising to near 56 by noon, then falling to around 47 during the remainder of the day. Breezy, with a south wind 11 to 20 mph becoming west in the afternoon. Winds could gust as high as 39 mph. Chance of precipitation is 100 percent. New rainfall amounts between 1 and 2 inches possible. Tonight: Mostly clear, with a low around 25. West wind 6 to 13 mph. Friday: Mostly sunny, with a high near 36. Wind chill values between 20 and 30. West wind 7 to 11 mph, with gusts as high as 21 mph. Friday Night: Mostly clear, with a low around 13. West wind 5 to 10 mph. Saturday: Mostly sunny, with a high near 27. West wind 5 to 7 mph. Saturday Night: Mostly cloudy, with a steady temperature around 24.